I have such a love hate relationship with food. I love to eat, I love to try new things, but, the actual joy of cooking and being in the kitchen? I haven’t found it. Maybe it’s because my littles are constantly asking for food and thus, I feel like I live in the kitchen. Seriously, every hour on the hour it seems Max is ready for more food. That boy is going to eat me out of house and home and he is only 3 1/2! More time in the kitchen means more dishes and such a tiresome cycle. And that, my friends, is why I like take-out best. But, I’m a mama, so cook I will. And, when I stumble across winner recipes, that’s when I share them here. While Max gobbles down all his plain, boring favorites, I have Jemma on the opposite end of the spectrum. She is my adventurous eater and this month we added a new element of excitement to her regular menu. We cut gluten from her diet! She has a pesky rash on her arms and legs and I read somewhere on the world wide web that it’s called “chicken skin”; a tell tale sign of a gluten intolerance. When I brought it up at her annual wellness visit her pediatrician kind of rolled her eyes and told me to exfoliate her skin. But, I’m not buying it, I think it’s diet related so we’re experimenting with what could be causing her reaction. Going gluten free has been easier than I expected. We have found many wonderful substitutes and are overall eating healthier since we’ve cut lots of carbs. But, hello, we’re Italian, so we had no intentions of cutting pasta! After a few brand taste tests we’ve landed on Tinkyada Brown Rice Pasta as the best substitute. Truly, you can hardly tell the difference! It’s available at most grocery stores and Trader Joe’s too! Making pasta is easy, but the real winner (and today’s recipe!) is this amazing bolognese sauce. A friend of my mom’s shared it with us and we’re so in love! 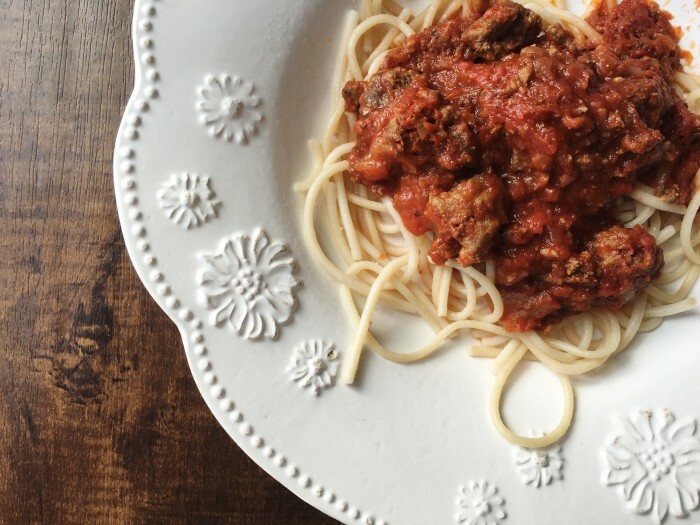 And, even though I don’t have a love for being in the kitchen, you all know I DO have a love for my slow cooker … and that’s how you prep this sauce. YUM! Prep 2 large skillets with 1 tablespoon butter and 1/2 tablespoon EVOO in each. In one skillet, add onions and garlic - season with salt and pepper. Cook until soft and lightly brown, about 5 minutes. Add the tomato paste and cook for a few minutes to blend the flavors together. In the other skillet add ground meats and cook until done. Transfer contents of both skillets to your slow cooker and add the tomatoes (and their juices) and the remaining spices. Cover and cook on high for 4 hours or low for 8 hours. Remove thyme sprigs and bay leaves before serving over pasta of your choice. Do you have some winner gluten free recipes? Jemma and I would love to try them out — leave us some links! It from her diet. And Gretchen is right, MANY people are sensitive or intolerant to gluten, and the small bumps people get on their arms or legs is a symptom of gluten intolerance. I’m sure she knows how to best parent her child. And I’d say she’s making a great decicison.